On October 3rd, we celebrate ê°œì²œì ˆ (gae-cheon-jeol) or the founding of Korea. According to the story written in the “Samguk Yusa” (or the “Memorabilia of the Three Kingdoms”), heaven sent Dangun as the founder of Gojoseon (Old Joseon) in 2333 BC. If you have seen the Korean drama “Jumong”, you would probably have heard about the people of Gojoseon. So how was Korea founded according to the legend? The Lord of Heaven called “Hwanin” had a son “Hwaneung” who wanted to live on earth. Hwanin sent his son along with 3,000 followers to Mt. 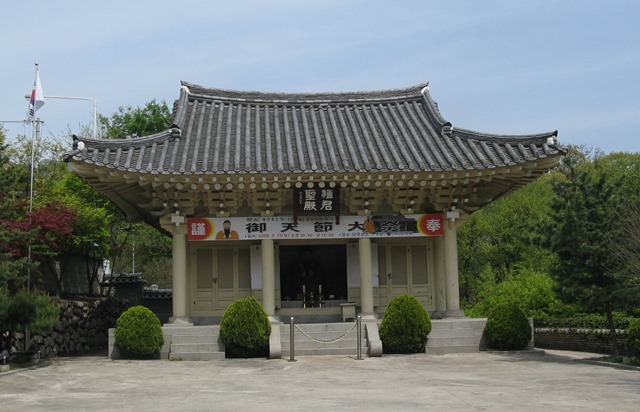 Baekdu, where Hwaneung founded “Sinsi” or the “City of God”. Meanwhile, a tiger and a bear prayed to Hwaneung to make them human. He told the animals to stay away from sunlight and stay in a cave for 100 days and gave them 20 cloves of garlic and a bundle of mug worth (sook-kat in Korean) to eat. The tiger gave up after 20 days but the bear endured. The bear transformed into a beautiful woman. The woman wanted to have a child and again she prayed to Hwaneung. He took her for his wife and soon they had a child they called “Dangun Wanggeom”. When Dangun ascended his father’s throne, he founded the walled city of Pyongyang and established the kingdom of Gojoseon.